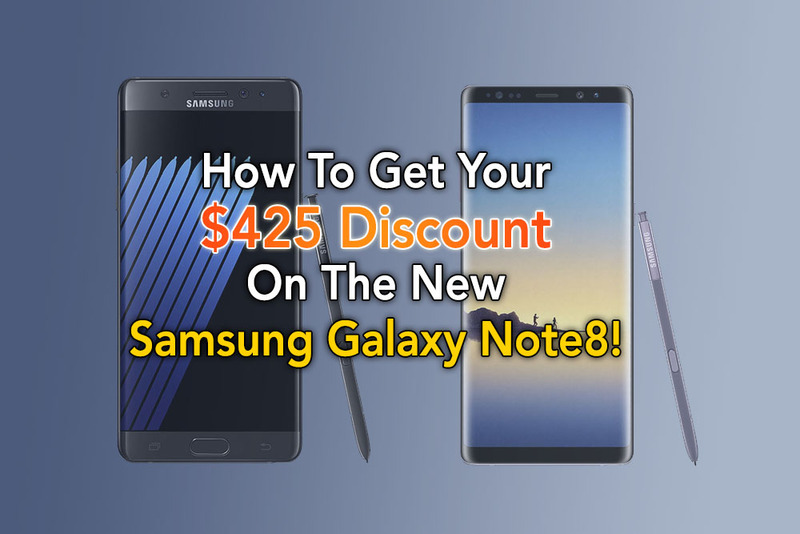 How To Get The $425 Samsung Galaxy Note8 Discount! If you are aching to buy the new Samsung Galaxy Note8, you will be glad to know that Samsung will be offering trade-ins and/or pre-order offers. In fact, they announced at the Galaxy Note8 Unpacked event that former Galaxy Note7 owners will be offered a special $425 (~RM 1,785) Samsung Galaxy Note8 discount! This discount will come in real handy, as the Samsung Galaxy Note8 is priced at $929 (unlocked) in the United States and £869 in the UK. That works out to about RM 3,900 here in Malaysia, just a tad more than the Samsung Galaxy S8+. So let’s take a closer look into the details of this special offer. This is a work in progress, as details are still scant. We will also add details of other trade-in offers and pre-order offers, as they are revealed. 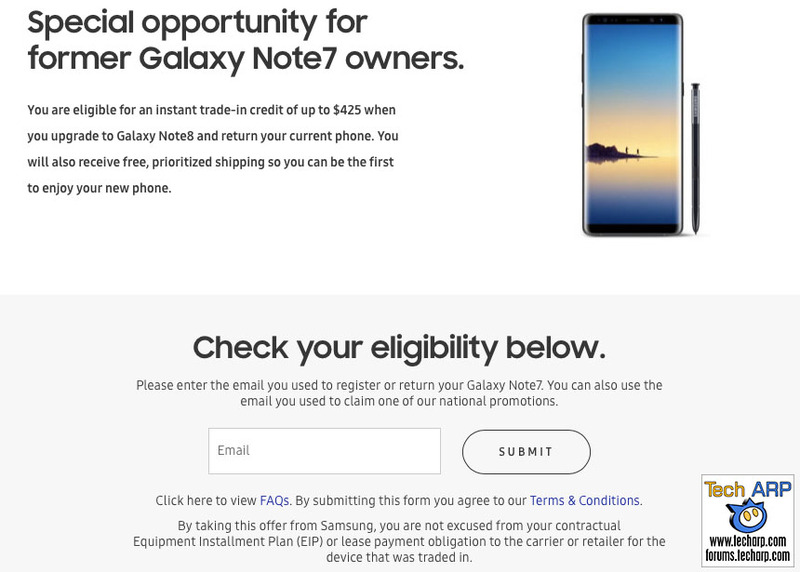 Updated @ 2017-09-02 : Added three important notes on the Samsung Galaxy Note8 discount programme. At the Samsung Galaxy Note8 Unpacked 2017 event, Samsung Mobile Communications President, DJ Koh explicitly acknowledged the mistakes they made with the ill-fated Galaxy Note7 phablet. He also thanked the former Galaxy Note7 owners for sticking with Samsung through the Galaxy Note7 recall. As a reward for their loyalty and feedback, Samsung announced that former Samsung Galaxy Note7 owners in the United States will be offered an upgrade discount of up to $425 (~RM 1,785). There are only two requirements for this special Galaxy Note8 discount – proof of purchase, and a qualifying trade-in device. Is not on a black list of any kind. You must have performed a factory reset and removed all personal information from the device. At the moment, we can only confirm that this special Galaxy Note8 discount is only applicable to consumers in the US and Canada. There has been no official word on similar programmes in other countries, although we understand that Samsung is preparing similar offers in every country the Galaxy Note7 was sold in. We reached out to Samsung Malaysia, and were told to “stay tuned” to their next Galaxy Note8 announcement on 5 September 2017. We think it is more than likely that there will be a similar special Galaxy Note8 trade-in offer for former Galaxy Note7 owners in Malaysia. The Samsung Galaxy Note7 was, after all, very popular and greatly missed by Samsung fans here in Malaysia. This offer is only available exclusively with Samsung. You must apply directly with Samsung. Your telco, dealer, or local retail store may offer similar upgrade programmes, but they are unlikely to offer anything close to what Samsung is offering you. Even if you purchased your qualifying device or the Galaxy Note7 from a telco, you can only get the Galaxy Note8 discount if you register with Samsung. In short – register with Samsung! Even though you own a qualifying device, you may not get all $425. Their discount you receive will vary from device to device. $425 is the maximum Samsung will offer for a qualifying device. The qualifying device you trade-in for the Galaxy Note8 discount must be fully paid for. If you are on an instalment plan, you must clear that instalment plan before you proceed. However, there may be situations where you may be permitted to continue paying your instalments, if it’s part of your telco plan, for example. Previous : The Olike XH3 & Hey 3S Smartwatches Revealed! Next : The 2017 HP A3 Multi-Function Printers Revealed!